Last month, we started a conversation about the implications of style/preference for Leaders transitioning into new roles. In that post, we explored some of the paradoxes faced during New Leader onboarding. And in the next four posts, we will explore the impact of the 4 primary dimensions measured by the Myers-Briggs Type Indicator (MBTI). This month, we are considering the Extraversion/Introversion dimension, and will correlate that with how New Leaders can apply this information to their onboarding process. This dimension indicates the primary source of energy (and thus orientation) of individuals. Extraverts draw sustenance from people and interactions, while Introverts are more likely to feel refreshed and energetic after time spent alone. 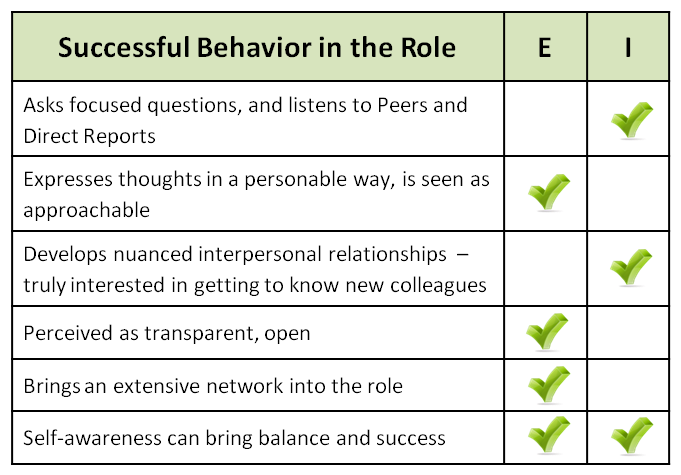 As you might imagine, New Leader transition can be a time of high people interaction, so it may be helpful to optimize onboarding effectiveness through self-awareness. 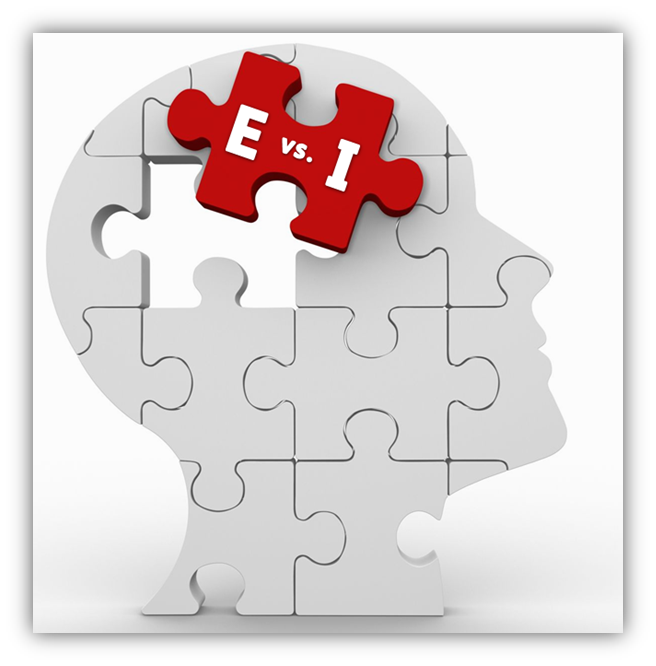 (Important to note: the E/I dimension does not measure shyness – that is an inherent trait that can apply to both Introverts and Extraverts). Candidates may look identical on paper, with very similar skill sets and historical work experience. 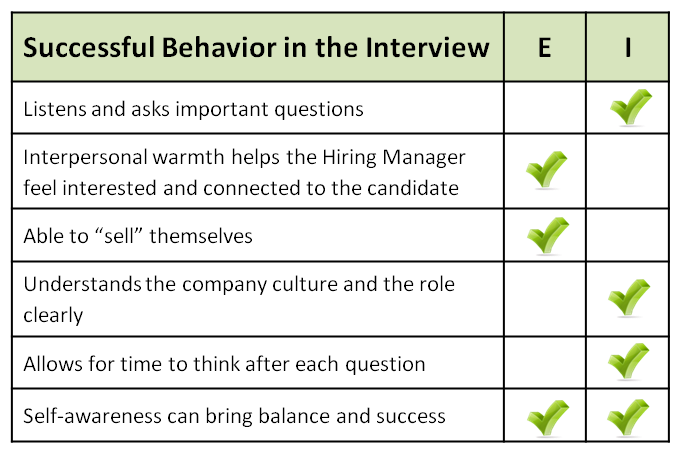 Hiring Managers need to understand what lies beyond the résumé, as the selection-process interviews usually determine which candidate is hired. As we know, the first impression created during a job interview can have great bearing on whether or not an offer is forthcoming. In this area, there are distinct advantages to being an Extravert or an Introvert. And the ideal candidate may be someone who manages to offer the best of both ends of the E/I dimension: a warm, approachable person with excellent listening skills. Once hired, both Extraverts and Introverts benefit by adopting behaviors that are included the range of possibilities for this dimension. New colleagues want to feel liked, understood and respected. They want New Leaders to value practices and precedents. Naturally, that involves listening, but it also requires enough approachability for the New Leader’s Peers and Direct Reports to let down their guard and share potentially negative information. The key is to interact in a way that inspires trust and connectedness. First of all, be honest with yourself -- about who you are, and where you are more comfortable when it comes to communicating and relationship-building. No one has the “right” preference for the role or for effective onboarding. Find the balance between leveraging your strengths and focusing on areas where you need to actively compensate for your preferred approach. Introverts might need to make a conscious effort to demonstrate warmth by adding a personal tone in their conversations. On the other hand, Extraverts should remember to slow down, listen carefully, and learn from their new colleagues and Direct Reports. Introverts become more effective when they remember to express their thoughts more frequently, while Extraverts may benefit from taking an active-listening approach. For instance, Extraverts (who are known as “external processors” and tend to think out loud) can signal they are listening by taking notes during conversations. This high-level view of the challenges faced by Extraverts and Introverts in new roles certainly carries many more nuanced details than the information contained here. And it is definitely worth the consideration of any Leader starting a new role. If you have questions about how these preferences may impact your (or you New Leader’s) onboarding process, contact us at info@leaderonboarding.com. Check back to this site next month for a discussion about how New Leaders can most effectively gather and process information about their new operation (the Senser vs. Intuitor dimension). 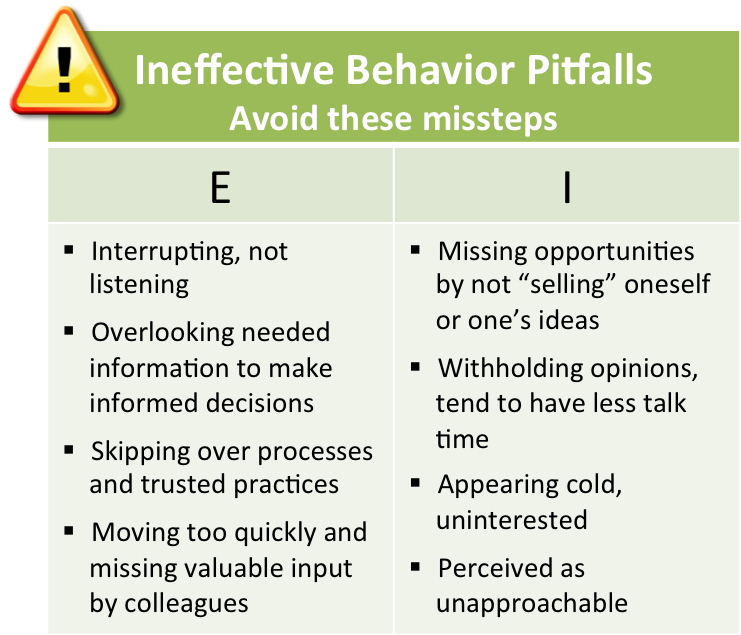 Posted in Advice for New Leaders, MBTI Series, OnBoarding as Risk Management.